I just picked up an S6 from att last week. The phone has been great coming from an N5 but the battery life is killing me. I am tempted to use my 14 day exchange for a Nexus 6. Does anyone have a good experience with both phones? The store doesn't have a N6 on display to play with to help me decide. Any input would be great. Sometimes with any new phone the battery is bad for the first few days. Has yours shown no sign of improvement? 1) If you have the screen on a lot, you won't get good battery life - the screen will probably be the largest battery consumer - especially with an Amoled screen and all that white (an Amoled's power consumption varies with the white level of the screen) Overall time between charges may improve a little (especially if you condition the battery - see The Care and Feeding of Lithium Polymer Batteries), but not that much. 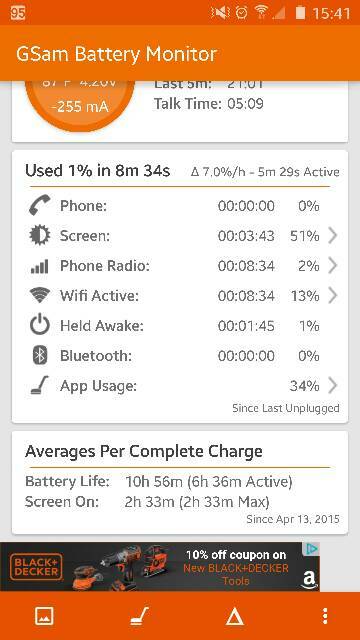 2) Look at your battery stats in Settings. Tap the graph to get to the second page. Look at the mobile signal. If it's not green all the way, you have a weak signal, and that's going to cost battery. (If the signal is weak coming from the tower, it's going to be weak going to the tower, so the phone increases its transmitter power, which eats a lot of battery.) Also look at the Awake line. If th phone is awake a lot when the screen is off, you'll have to find what's waking it and make some changes. I had the N6, from Moto directly and ended up sending it back. One reason was I wanted a smaller phone, but I also found the battery life was not as good even though it has a huge battery. On the S6 which mine will be here on Monday, there is supposed to be an update for some Samsung app that is supposed to help with battery life. Plus as mentioned it can take a few days to break in the new battery. I am going to get the N6 unless someone can convince me not too. And Go! How to add Samsung Flipboard App Widget to Nova Launcher? How to add song for a text message sound? By powerbyte in forum New to the Forums? Introduce Yourself Here! Why does my Google Keyboard refuses to update?